Staxxon, LLC based out of Montclair, NJ was recently issued CSC Certificate Number USA/MC/101/12 on April 12, 2012 by Marine Container Equipment Certification Corp. 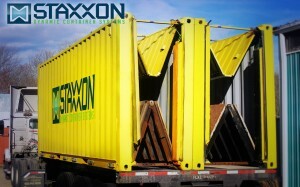 The Certificate was issued, and all ratings were established because Staxxon’s patented folding/nesting steel container design is able to be safely loaded and moved with shipping commodity weights and volumes that are typical for a 20 foot ISO/IMO shipping container used for ocean, rail and truck transport around the world. Gross Interior Volume Capacity for the Staxxon container design, based on interior dimensions totaled 1,149 cubic feet (32.536 cubic meters) giving Staxxon the necessary dimensions to meet today’s shipping needs. The beauty of the design is Staxxon’s design reduces return operating costs by folding empty steel containers from side to side , not much unlike an accordian and fitting up to 5 empty, collapsed containers into the same space needed for 1. All this is done while remaining within ISO dimensional requirements. With previous technology, it would take 5 trucks to drop off 5 empty containers at a port or terminal. With Staxxon’s technology, one truck pulling a chassis can drop off 5 empty containers. Also worth noting, all of the commonly used equipment at marine, rail and truck terminals can move 5 empty containers with 1 move instead of 5 moves. Todays shippers & carriers (whether they be ocean, truck or rail) as well as terminals and ports stand to save considerable time, energy, and most importantly money by utilizing Staxxon’s folding containers. The reduction of moves, and minimization of return cost of empty containers are one of the biggest incentives for carriers and shippers worldwide.